Could New Bipartisan Bill Force 2016 Contenders to Tackle Too-Big-To-Fail Banks? In a move explicitly aimed at reining in risky Wall Street excess, a bipartisan group of lawmakers led by Sen. Elizabeth Warren on Tuesday introduced what they call a “21st Century Glass-Steagall Act” that would restore the wall of separation between investment and commercial banking. While its sponsors say the proposed legislation (pdf) would protect taxpayers and make “Too Big to Fail” institutions smaller and safer, its introduction has the added benefit of putting Democratic frontrunner Hillary Clinton in the hot seat on Wall Street reform. The bill (pdf) was introduced Tuesday by Sens. Warren (D-Mass. ), John McCain (R-Ariz.), Maria Cantwell (D-Wash.), and Angus King (I-Maine), who say it would reduce risk for the American taxpayer in the financial system and decrease the likelihood of future financial crises. The original Glass-Steagall legislation, they explained in a statement, was introduced in response to the financial crash of 1929 and separated depository banks from investment banks—with the goal of dividing the risky activities of investment banks from the core depository functions that consumers rely upon every day. Its proponents, including presidential candidates Sen. Bernie Sanders and former Maryland Gov. Martin O’Malley, contend that President Bill Clinton’s repeal of the legislation in 1999 was part of deregulation that contributed to the 2008 economic collapse. Put simply, the legislation would separate traditional banks that offer savings and checking accounts and are insured by the Federal Deposit Insurance Corporation (FDIC) from riskier financial institutions that offer services such as investment banking, insurance, swaps dealing, and hedge fund and private equity activities. While that may be true, the bill is likely to provoke questions on the 2016 campaign trail about candidates’ attitudes toward Wall Street and big banks. Progressives are demanding such proposals from Wall Street candidate Hillary Clinton in particular—and getting little in the way of response. 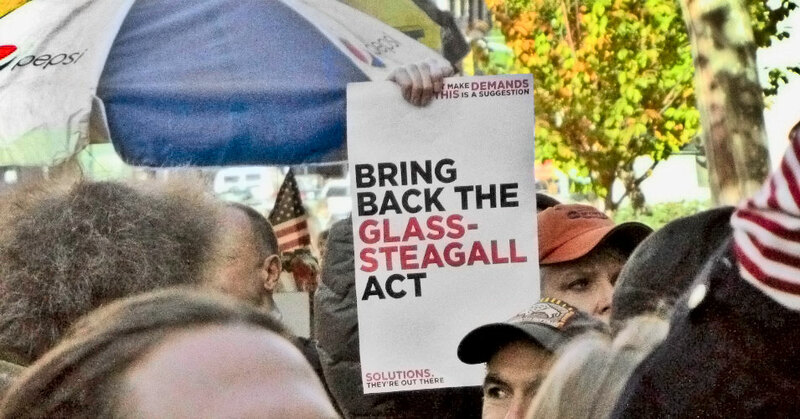 According to Public Citizen, more than 700,000 Americans have signed multiple petitions (see here, here, and here) calling for the restoration of Glass-Steagall.